Showing: You can help reduce undesirable changes in behavior and mood by suppressing your mare’s estrous (heat) cycle with Regu-Mate® (altrenogest). 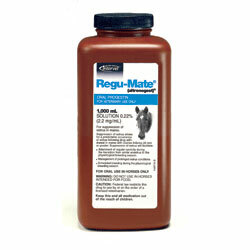 Within three days of the start of treatment, Regu-Mate will effectively suppress estrus in 95% of mares. Breeding: As a mare enters estrus and prepares for breeding, her levels of estrogen rise. After she ovulates, estrogen drops and is replaced with an increasing amount of progesterone. Progesterone prepares her uterus for pregnancy and prevents abortion of the fetus. Roughly 14 to 16 days after ovulation, if the mare is not pregnant, her progesterone levels decline and the cycle starts over.